Again, another one of the blogs that I follow had a good post about stockpiling. 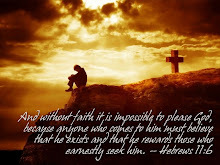 I've been doing my fair share of this the past couple weeks and I love it. I've been getting a ton of free stuff and it has made life so much easier. We're getting to the point where we can give away stuff now and that make both Nate and I happy that we can help others. Nate has really gotten into it too...he loves to see what I've gotten and guesses how much I've spent. He always guesses way more than what I've spent and when I tell him the final price he loves me all the more! You have to take a look. You can read the whole article here. Thanks "Life as Mom" for the great info! 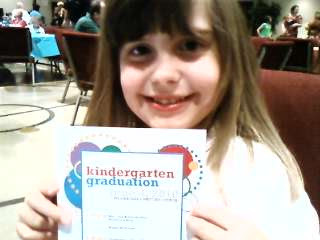 Last night, Aiva officially graduated from Kindergarten. 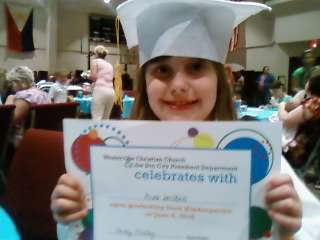 Her last day at Big Walnut Elementary was on Wednesday and then we had Graduation at church. She had so much fun. You can see that she almost felt like she was an adult getting all this attention for graduating! Here she is 6 but she was walking and talking like she were 16. Not in a regular 16, don't mess with me, I'm too good for you sort of way. Just an older, sophisticated, more grown up sort of way! We had dinner and then the "commencement" started. The graduated came in and filed up on stage then Ms. Becky gave the address to the graduates. It was great...she told the students that they needed to ABC...Always Be Christ. Whenever they were close to having a bad attitude and talking not so nice to others that they needed to think ABC...Always Be Christ. She even gave the graduates ABS silly bands. Aiva thought they were so very cool! Once Ms. Becky was done, she passed out the diplomas and then there was a slide show with all the kids pictures. It was quite moving. It was so great to see all these kids and to think that these are the kids that Aiva is grow older with. These are the kids that she's going to go to camp with...the kids who she's going to go to football games with...the kids who she's going to grow closer to Jesus with. I was so proud of her last night. I was so proud of the girl that she has grown to be and so proud that she's my daughter. I love you Aiva! Today was a sad day for Aiva & Ana. Their good friend Sunrise moved. We knew the day was going to come but we didn't know it would be so soon. When Sunrise came over today and said today was the day and they were loading up their stuff you could just see Aiva's shoulders sink. I felt so sorry for both my girls! Their friend who they loved hanging out with and laughing with was going away. It took me back to when I was 6 and we moved from Grove City to Westerville. I left behind my friend Michelle. She was my best friend...we swam in our pool, had sleepovers, played with Barbies...everything. I remember sitting backwards in our old green Hornet staring out the back window as Michelle waved goodbye and she began to get smaller and smaller the further away we drove. Aiva had that same feeling today and all that came to mind was, "Its gonna be OK". I had the radio on and both girls loved to sing but today there were no songs coming from the backseat...only muffled cries and little sniffs. We had high hopes for Sunrise. My girls were teaching her about God and I could really see them growing as they talked about Jesus to Sunrise. We prayed today that Sunrise would remember their talks and that she would want to be more like Jesus too. Even though it was a rough day, a smile was brought to my lips as I can see how much all three girls have grown. I just read an amazing article on debt by one of my favorite fellow bloggers. You have got to take a look at this. Click here to get to it. She talks about taking extreme measures to stay out of debt. her family did it while her husband was in law school and they lived on around $12,000 for the year. She gives 28 ways that helped them stay out of debt and get by. Very inspiring! Hope it touches you as much as it touched me. Thanks Money Saving Mom for sharing! 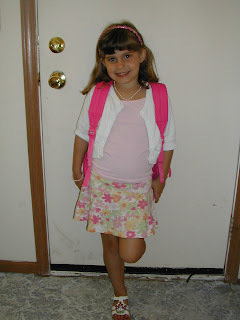 Today is my baby's last day of school. 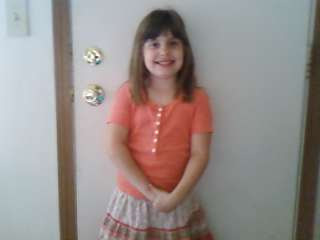 She is officially in 1st grade! I can't believe it. Time goes way too quick. It seems like just yesterday that we were putting her on the bus and watching her ride off. She is so excited to move up, but at the same time sad to leave Ms. Mayer and all her friends. She's had a great year and has learned so much. We are so proud of the girl that she is becoming and are anxious to see her blossom into a lovely young lady.